Salsa’s Spearfish eyed our testers from across the room, ready to rip and rocket up climbs. But we were suspicious of the 80-millimeter-rear-travel bike’s intentions. Once we got on trail, though, all preconceived notions regarding Salsa and the Spearfish evaporated as we got to hammering and discovered the true nature of this lean machine. Every bike that crosses our workbench packs some sort of a surprise. Even objective journalists have expectations, and we truly enjoy getting blown away. The Salsa Spearfish did just that. It's rare to hear us say this about an XC bike. Some are lighter than others. Some ride more like trail bikes, as we love to say, but few offer what this one does. The Salsa brand conjures images of steel hardtails burdened by canvas touring bags crossing the tundras of Minnesota. But the bright-orange, carbon-fiber, Split Pivot-suspended Spearfish is quite a different animal. At first glance, we all saw a modern cross-country machine given its feathery weight, 69.3-degree headtube angle, flat but comfy bar, and the 100-millimeter Thomson X4 stem on our size-large test bike. And on the climbs, it behaved like we expected. It was a rocket on rails. Comfortable, active, but especially responsive. Each of this year's XC bikes was an expert climber, but this one rode like some sort of magic levitating hardtail. We were split about the 2×10 spec, though. We knew the Spearfish was fast enough to shed its front derailleur, but some testers are not always preoccupied with speed. One BIKE editor who has roamed for thousands of miles at the ends of the earth holds Salsa's "Adventure by Bike" slogan close to heart, but often holds his granny gear closer. Others were just tired and wanted to conserve their energy for the descents. We had questions about the new bikes before we even got our test rigs, so we sent out a few queries—the kind of things we thought you might be asking yourself when you're looking at this bike. Then we sent out another round of asks if any major questions or issues came up during testing. Here's the feedback we received from Salsa marketing manager Mike Riemer and Salsa product development engineer Peter Koski. VERNON FELTON: Given the short-travel design, the Spearfish could be seen as either an XC race machine or a long-distance, marathon bike…or, I suppose, both…though I think those are slightly different breeds. Do you see the bike leaning towards one discipline more than the other? MIKE RIEMER: Our intent with the Spearfish was to create a super efficient, ultra-endurance racing mountain bike. We're talking 100-milers, 24-hour races, multi-day bikepacking style races like the AZT 750 or AZT 300. Our goal was to take the edge off the roughest stuff without letting the suspension remove pedaling efficiency. Also, when working on the frame geometry we wanted to create a bike that remained manageable late in an ultra-endurance race…hour 22…or mile 85. We wanted the Spearfish to handle well, without getting twitchy and demanding 100 percent of your attention at all times. VF: I see you're running a 51-mm offset fork, what used to be a Gary Fisher exclusive. Was the goal here to keep trail manageable without resorting to an overly steep head angle? PETER KOSKI: We designed the Spearfish around a specific steering feel (mechanical trail). This steering feel could be achieved with either a 45-millimeter offset fork and a steeper head tube angle or a 51-millimeter offset fork and slacker head tube angle. Given the choice between the two, we like the 51-millimeter offset and slacker head tube choice, as the slacker head tube provides other benefits like better angle of attack over obstacles, more confident descending, and added front center (adds to wheel base/stability). 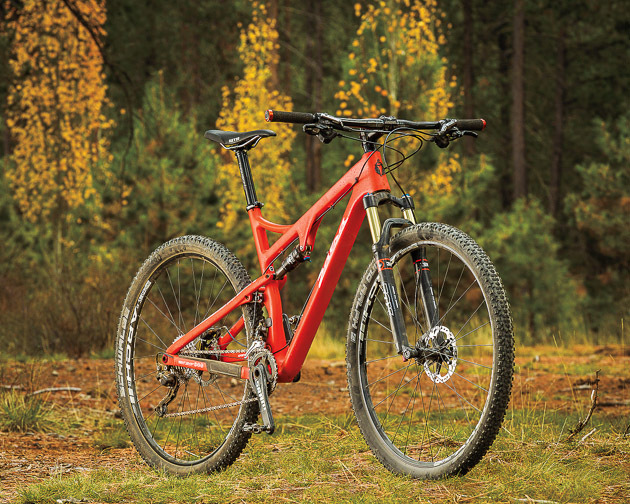 VF: Without sounding like a total geometry-chart-obsessing crank, I have to mention the 69.3-degree head angle, which is sorta slack for a 29er XC rig. Was the goal here to create a bike with more forgiving front-end traits? I could see riders, at mile 80 in a race, wanting a bike that steered a bit more calmly than is typical on a bike with, for instance, a 71-degree head angle. PK: Essentially yes, the slacker front end helps keep the bike calm, as well as more confident at descending and negotiating rocks/log piles, which is helpful when you are haggard and making poor line choices. Another thing to note is that compared to the previous version of the 'fish, we pulled 18 millimeters of length out of the chainstay (455 down to 437). This reduction also reduces wheelbase if we change nothing else. The slacker head tube angle increases front-center. For a medium-size frame, the new Spearfish actually has 7.5 millimeters more wheelbase but with 25 millimeters more front center than the old one. This translates to a similar stability (total wheelbase), but with more room on the front half of the bike to move around before encountering that spot where it feels like you are going over the bars. Likewise – the shorter rear end is quicker/easier to weight change off the back of the bike for turning and negotiating corners and obstacles. It's kind of like the 45 vs. 51-millimeter offset fork idea: If you can choose between two identical wheelbases, the bike with less rear center and more front center feels and rides like the quicker and more nimble bike, but with the same overall stability. The previous version of the Spearfish did not have the same anti-squat properties as the new Split Pivot design version. When trying to characterize how the old bike rode and translate those traits that we did like to the Split Pivot version (while leaving behind what we didn't like) we had to account for the fact that under pedaling load, the old Spearfish squatted deeper into its travel than the new Split Pivot version would. That's because of the anti-squat properties of Weagle's system. This means that the old bike was riding lower and slacker than it actually showed on paper – to retain some of those similar numbers/feel under load in Split Pivot, we need to start lower and slacker because the anti-squat of the system keeps the bike higher in its travel under pedaling load. VF: The Spearfish's rear end is designed with 2.25-inch tires in mind. How large can you actually go? Is there enough chainstay clearance for, say, a "typical" 29×2.35 tire? MR: Legally, the bike is designed for 29×2.25 tires. That is the maximum we can say based on EN testing standards and the amount of clearance on each side of the tire that fits the definition. VF: The Spearfish is on the shorter end of the rear-suspension spectrum, even for an XC-ish bike. Why 80-millimeters in the back, as opposed to 100? MR: This all goes back to the initial concept of creating an extremely efficient bike. The historical legacy product that in some ways inspired the Spearfish was our old soft tail 29er, the Dos Niner. When we began working on the Spearfish one of the initial thoughts was let's make a bike that has more travel than the Dos, but is just as (or maybe even more) efficient. In addition to helping create a super efficient bike, 80 millimeters of travel makes a very important statement about the bike that IMO would frankly have been lost if the bike had 100 millimeters of rear travel. It doesn't just deliver a certain type of ride quality, it also helps tell the customer what type of ride quality they should expect. So in the end, Salsa and Dave worked to determine the riding traits we wanted the bike to have, what its purpose would be, and then designed the bike. We're asked this question a lot by the way, but in the end the Spearfish is a very known quantity…and for many folks it is the right bike, with the right amount of travel, for the type of riding they are doing. VF: Are there any particular features/traits that you guys struggled to achieve and feel are important, but which might get overlooked at first glance? MR: The 437-millimeter length chainstays might not be overlooked, but they are pretty short for a 29er, especially if you consider that we did that in 2012. I also think it's important that folks understand that Salsa didn't just go out and license Split Pivot and throw it on some bikes. We license Split Pivot and work with Dave as a consultant. Working with Dave really is "working WITH Dave". The process started by riding our existing bikes and talking about the ride qualities of those bikes, then riding other brand bikes and talking about those qualities, and then coming up with a desired ride quality and setting out to build it.